Select an option 00 0 7/16" 1/2" 5/8" 3/4"
Beautiful highly polished ear plug gages made from real bullets that have been shot and fired. Brass casings are highly polished and sealed to help prevent tarnish. Nickel bullets are not polished but are sealed to add some slight sheen and protection. Particular caliber and brand of bullet varies depending on the size gauge you need. The pictures in brass show a 5/8 (larger one) and the smaller one is a 7/16. The silver nickel one shown & the one shown in ear are a size 00. *00 shown in ear has model’s silicon gauges around the outside of the gauges for a more secure fit. Delivered fast and my favorite new plugs. I completely forgot to leave a review but love them. Didnt like them. They wont stay in. 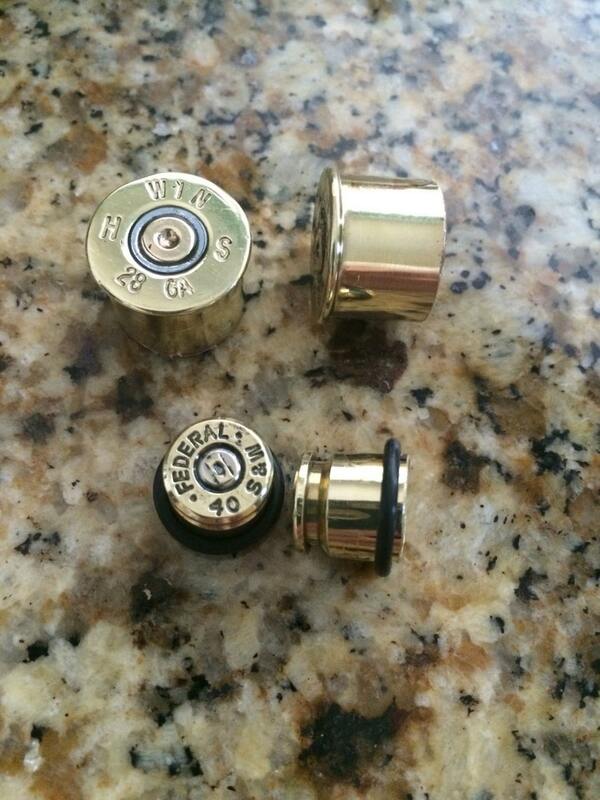 Graduation Ammo bullet jewelry 20 gauge shotgun shell necklace. Antique filagree round lace backing.